I'm really excited about this pack and naturally I'll document my findings here. I intend to post this wrap up in 5 parts so you can follow along only a few days behind me. I'm hoping it'll be a great journey and I'm looking forward to trying some Bridge Road beers that I haven't had a chance to sample yet. Let's get into this! 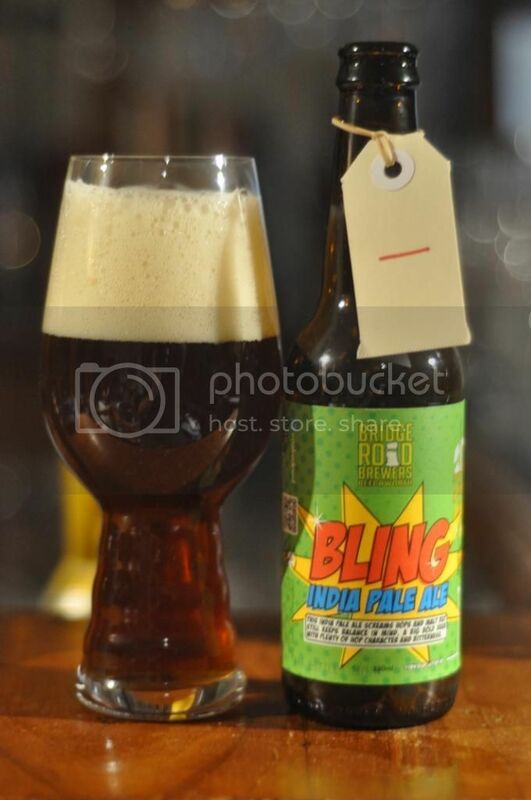 Day 1 - Bling IPA - This is actually the first time I've had Bling, although I have had it's big brother Bling Bling. The first thing that struck me about this beer was how dark it poured, and this certainly translated to the nose which was quite big and malty for an IPA. Don't worry though hop fans, it also packs a bitter hoppy punch with citrus and tropical fruits very prominent on the nose. The flavour is a beautiful balance between strong malt and hop flavours. For an IPA that only clocks in at 5.8% it certainly punches above it's weight in terms of flavour. I can't believe I haven't tried this beer before - I'll definitely be back for more! 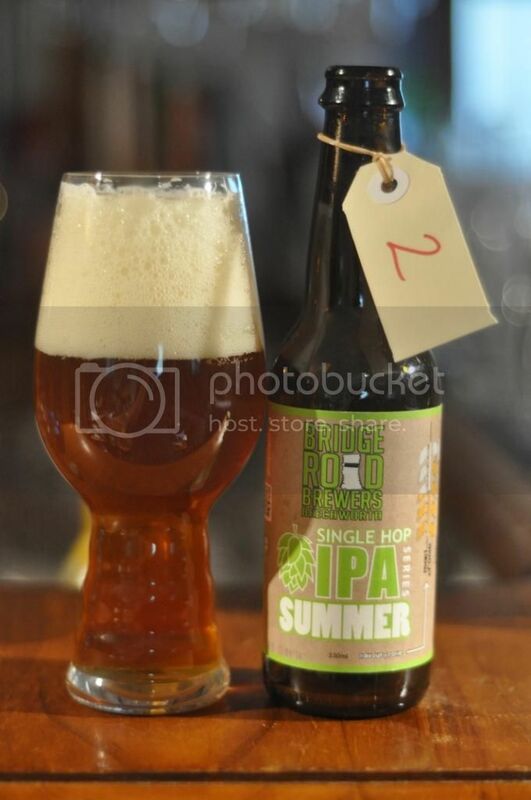 Day 2 - Summer IPA - Sticking with the IPA theme for Day 2 and we have the single hop Summer IPA. I've had this beer before and was suitably impressed then. Tuesday is normally an alcohol free day for me but hey, it's almost Christmas! This beer pours a much more standard, lighter, colour for an IPA. The nose is quite light with floral and apricot aromas. Somewhat strangely the taste doesn't quite follow... It is still relatively light but the dominant flavour I get is pine resin. There is also some fruitiness, nothing obviously distinguishable but definitely fruit. It's a refreshing hot weather IPA, but certainly isn't a world beater. 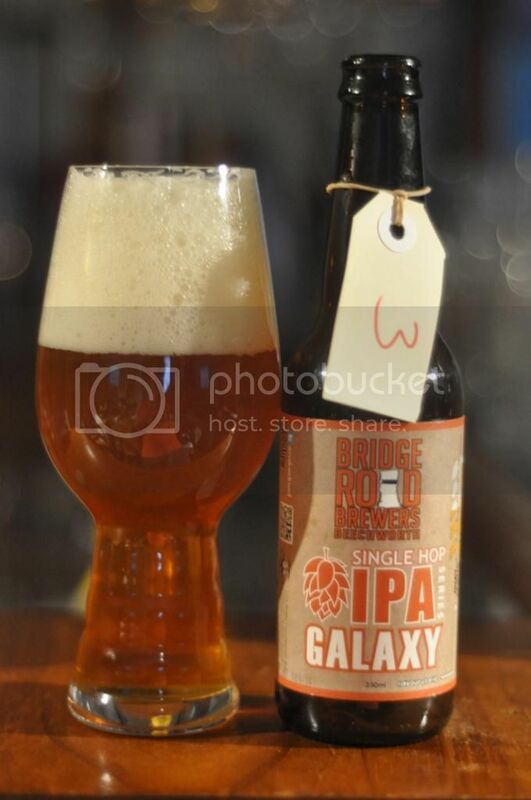 Day 3 - Galaxy IPA - Day three brought us another beer from the Bridge Road Single Hop IPA range. Today's hop is Galaxy; quite possibly the best Australian hop ever developed. The main difference I notice in terms of appearance, compared to the Summer Single Hop, is a head which last significantly longer and is thicker. I've always been a fan of this beer, it showcases Galaxy beautifully. You get all the citrus and tropical fruit flavours, particularly passionfruit, coming through on the nose. The taste follows along these lines. It's actually slightly sweet and not particularly bitter, which lends it's self to being very quaffable. Day 4 - Hefeweizen - Today we moved on from the IPA's and thus I decided to dispense with the Spiegelau IPA glass and crack out the Bridge Road glass, which you'll be seeing plenty more of I imagine. The pour of this beer onfused me last time I had it as well, it seems very carbonated but the head is small and dissipates fast. 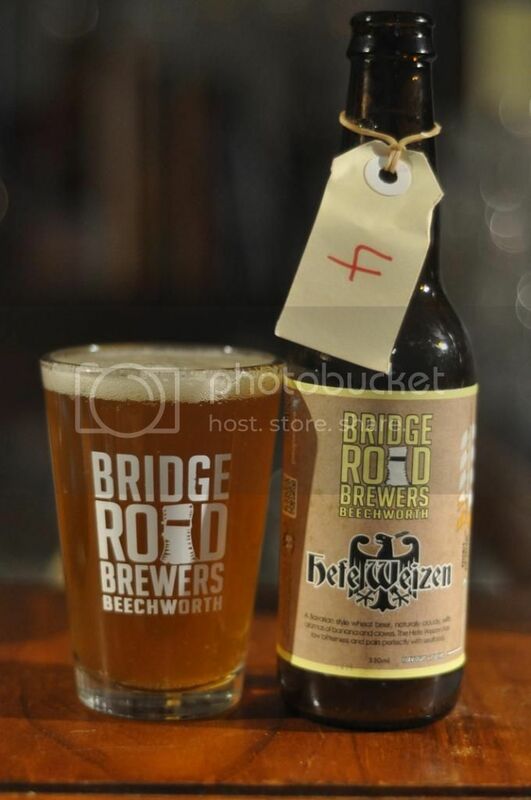 Bridge Road's Hefeweizen has plenty of banana on the nose. Much like it appears there is a bit too much carbonation and the beer suffers a little because of it. That aside, the predominantly banana taste is appropriate for the style and a touch of clove spiciness really adds to this beer. It's a good refreshing beer but certainly isn't in the top echelon of Australian Hefeweizen's. 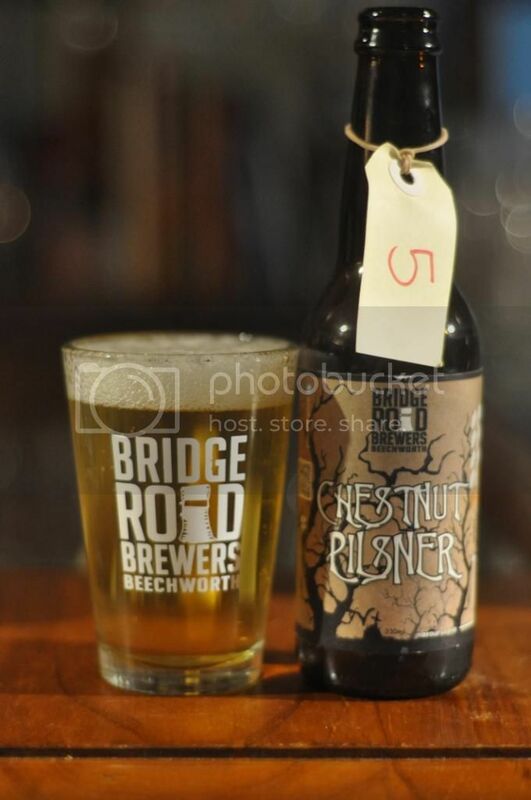 Day 5 - Chestnut Pilsner - I was quite a few pints in when I cracked into the Chestnut Pilsner on Day 5 of #beerdvent. This pilsner is actually brewed with Chestnut's and from my memory of the last time having this you could actually taste them. First though, the pour is stereotypical for a pils - with a very light straw yellow colour with thick white head. My memory didn't let me down, at least on the nose, with a chestnut aroma being quite prominent. There was also light malt and a citrus hop bite that transferred over to the taste. The thing that makes this beer stand out from other pilsners is the nuttiness. It really comes through well. It's a nice crisp example of the style. Five days into #beerdvent and I'm pretty happy with how it's going. I haven't mentioned this so far but the Spiegelau IPA glass that was added in the pack was a very nice surprise. I can't wait to find out what other beers they've included in the pack, hopefully as we get closer and closer to Christmas the rare stuff comes out!